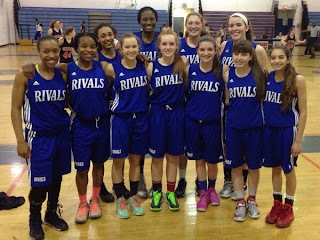 In just a few short years the Rivals Basketball Club has become recognized as one of the premier AAU programs in the northeast region for girls looking to play college ball. And with AAU season now in full swing the NH Notebook was in the house for their skills and drills workout on Tuesday night at the Brooks School in North Andover, MA to scout the local talent. 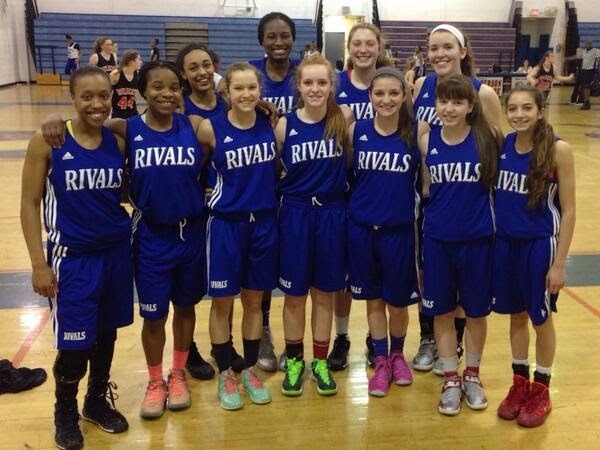 The Rivals are coached by Scott Hazelton, who runs a great workout with nothing but skill work. Intense, demanding, fast paced drills. They started off with ball handling, followed by full court drills before getting into controlled scrimmages. There was roughly 30 players in the gym, all working hard. They were being pushed by playing against former Rivals (and BG) player Jamie Sherburne, who was giving back to the program she played for the past 2 years. Sherburne will be playing at D-I Niagara University this winter. Another player out there who was raising the level of play was Ciara Dillon from Mass, who is only a sophomore but is a sure-fire D-I recruit. Here's a look at the top local players in attendance. Taylor Choate, 5'7" Guard, Nashua High North - Choate is a versatile guard, as she plays the 1 on her high school team but in scrimmage action on Tuesday night she was playing off the ball. Choate showed the ability to move without the ball, find an open space in the defense and hit shots in rhythm. She has always been known as a deadly slasher with a killer euro-step, but you have to respect her jumper too. Val Martin, 5'10" Guard/Forward, Pinkerton Academy - Martin is a dominant inside force, but it's clear that with the Rivals she's working on expanding her game out to the perimeter, as she was even running the point against full court pressure. Physically Martin is a beast, the strongest player in the state. She battled inside for points and rebounds and hustled after loose balls during drills. Gabrielle Hunter, 5'9" Forward, Bedford HS - Hunter just keeps working hard and just keeps getting better. Hunter is strong, athletic, she doesn't try to do too much out there - she just makes plays. During scrimmage action she had one of the better dribble-drive moves of the night, slashing from the wing into the paint with a hesitation dribble and then finishing strong in traffic. Hunter crashed the boards and showed a smooth catch-and-shoot release. Megan Kerutis, 5'5" Guard, Bishop Guertin HS - Kerutis is a tough-as-nails guard who only knows one speed to play the game - all out, 100%. The type of player who would run through a wall to help her team. Kerutis played tough defense and finished in transition. Courtney Henrich, 5'5" Guard, Phillips Exeter Academy - nobody hustles like Courtney Henrich. It is fun to watch a player out there diving on the floor for loose balls, scrapping for boards and sprinting back on 'D', and that's exactly what Henrich does. A true blue collar player, Henrich also hit shots off the catch. Amanda Torres, 5'7" Guard, Trinity HS - Things are going pretty good for Torres right now. She led Trinity to their best season in years, made D-I first team all-state and last weekend had a big tournament for the Rivals in Philadelphia. Simply put, nobody attacks the rim and finishes quite like Torres. She is just so quick off the dribble, and once she gets into the lane she kicks in an extra gear to explode to the rim. And whether it's on the break or the half court, she always finishes strong and never misses inside. Those attributes, as well as her overall quickness and work ethic, were on full display Tuesday night. Bri Purcell, 5'5" Guard, Bedford HS - Purcell is a pure point guard who excelled at penetrating into the lane to make plays off the bounce. She is a highly skilled, fundamentally sound, intelligent player who plays hard, she plays the game at a fast pace and a high level. She showed the ability to score but was even better at setting teammates up. Jocelyn Chaput, 5'6" Guard, Nashua High South - Chaput ran the floor hard on the break and looked for her shot, either taking it strong to the rim or hitting the mid-range jumper. She played hard, she played smart, making good decisions with the basketball and also worked hard on defense. Chaput also runs cross country, so she's one of those players who could run for days and not get tired. Sara Sherburne, 5'8" Guard, Bishop Guertin HS - Sherburne saw limited minutes this year for BG and when she did it was to provide a shooting touch off the bench. She showed that same shooting touch on Tuesday night, but she also showed a rapidly improving overall skill set. Sherburne was one of the hardest workers in the gym and not only hit shots but showed good speed and the ability to make plays off the dribble. She has clearly been working hard on her game, along with older sister Jamie Sherburne. Ashley Berube, 6'0" Forward, Londonderry HS - You can't teach size, and Berube is not only 6-foot, but she has a strong, rugged frame and she used her size to advantage by muscling opposing players in the paint for low post position and rebounds. She also showed improved footwork and post moves. Abigail Streeter, 5'11" Guard, Nashua North HS - Streeter is another player who worked her tail off out there. Not only that, but since she is a 5-foot-11 wing player who is only a freshman there is no question she has a high upside. We knew Streeter could shoot it already, but on Tuesday night she made a point of attacking the rim, and she had a number of high level finishes inside as well as hitting shots off the catch. Jillian Kolbert, 5'5" Guard, Salem HS - With the graduation of Brenna Blakslee, Salem will need a new point guard. That player might just be Jillian Kolbert. Kolbert is a combo-guard who can handle the ball vs. defensive pressure and has a high basketball I.Q. She hit the open man and spaced the floor well. Chyna Bullen, 5'10" Forward, Central Catholic HS - The Exeter, NH native played at Portsmouth Christian Academy this past winter as an 8th-grader. Watching her play out there against mostly sophomores and juniors, Bullen definitely did not look like an 8th-grader. She has the size, an athletic frame and a polished skill set. uring drills and scrimmages Bullen finished time after time, through contact and in traffic. If she gets the ball in the paint, she's scoring 2. Bullen now takes her game to Central Catholic where she looks to make an immediate impact for one of the top programs in Massachusetts with the graduation of post player Amanda Williams. Brooke Rooney, 5'2" Guard, Timberlane Regional HS - There was over 30 players in the gym, but the one kid who was turning heads right in the beginning of the workout during ball handling drills was Rooney. Her handle is simply off the charts for an 8th-grader. Rooney is lightning quick, plays hard and hit shots. There hasn't been a freshman player come in to Timberlane with this much talent and potential in a long time. Alana Choate, 5'6" Guard, Nashua High North - Yes, there are more Choates on their way to Nashua North. First it was Summer, then Taylor who will be a senior next year. Next up is Alana, who has been one of the more talked about middle school players in the Nashua area and now looks to make an immediate impact for the Titans next year. Alana is an athletic wing with a strong frame and really hustled out there on both ends of the floor.